The Road to Deep Space Nine. By the time The Next Generation entered its fifth season, the series was enjoying such amazing success and popularity that the studio decided it was time for a third dip into the Star Trek well, and Deep Space Nine went into production in 1992. But what would this new show be about? Which characters would carry over? What species would be highlighted and developed further? The answers would come from specific episodes of The Next Generation. In this episode of Earl Grey, hosts Lee Hutchison, Richard Marquez, and Amy Nelson look at the beginnings of Deep Space Nine through the lens of The Next Generation. We discuss how TNG set up Sisko’s introduction with “The Best of Both Worlds,” as well as how the Romulans and Bajorans were portrayed in “The Wounded,” “Ensign Ro,” and “Chain of Command.” This initial setup allowed for an incredible arc to be fleshed out more fully on DS9. Earl Grey has enjoyed 155 episodes with Daniel, Darren and Phillip. We encourage everyone to listen to the amazing work these three have contributed to Star Trek fandom. We are indebted to them and thank them. We have a feeling of great joy and gratitude. Star Trek is celebrating its 50th anniversary this year, but our new hosts aren’t that old. So how did our new crew come to know Star Trek? How did our new crew come to love The Next Generation? In this episode, you will get the chance to meet our new hosts, Lee, Richard and Amy. Hear how each of us found Star Trek and why we love The Next Generation. We talk about our first influences and how our fandom grew so much so that we are now hosts on Trek.FM. We also discuss how Trek.FM has rejuvenated our passion for The Next Generation and Star Trek in general. Enjoy our individual paths to Star Trek and hopefully you will think on your personal journey and fandom for Star Trek. Star Trek has been described as a show about a utopian future; but only The Next Generation really showcased this vision. The Original Series showed the Federation fighting many battles with the Klingons, Deep Space Nine brought war and an undermining of Federation principles by Section 31, Voyager had terrorists serving on the crew, and Enterprise found early explorers struggling with morality. During The Next Generation, it truly was peace time and the Federation and the ideals of Roddenberry that it represented were explored in a way no other series could. In First Contact, Picard remarked to Lilly that money doesn't exist in the 24th century and that wealth is no longer the driving force. Instead humanity works to better itself. In this episode of Earl Grey, hosts Amy Nelson, Richard Marquez, and Lee Hutchison explore Star Trek's vision of a utopian future, whether the society portrayed on The Next Generation is possible, how it could be achieved, and the consequences of a world without money. In 1996, Star Trek was celebrating its 30th anniversary, and the biggest event of that year was the release of First Contact. Through the big screen success of Star Trek Generations, the cast of The Next Generation proved it could carry a blockbuster movie. A sequel was guaranteed. With a brand new Enterprise, new uniforms, a bigger budget, and the Borg, anticipation for First Contact was at fever pitch. In this episode of Earl Grey, new hosts Amy Nelson, Richard Marquez, and Lee Hutchison go back in time to 1996 to remember their experiences of the build up toFirst Contact, and how they felt when they came out of the cinema screens. Then they return to 2016 to examine the legacy and impact of this film that garnered universal praise from fans and critics, earned an Oscar nomination, landed in the box office top ten for 1996, and was the highest grossing Star Trek movie until 2009. "The trial never ended, captain. We never reached a verdict. But now we have. You're guilty." Daniel Proulx, Darren Moser, and Phillip Gilfus stood, provisionally, as representatives of Star Trek: The Next Generation fans for three years - never missing a week of giving testimony and evidence in defense of their favorite Star Trek series. But they now stand before Q one last time to receive their final verdict. The trio ends their time on Earl Grey in this episode - remembering their favorite podcast moments, what kept them coming to the mics week after week, what they believe are the "essential" ingredients for doing a Trek podcast, and what they will keep with them as they move on to their next adventure together. Listen for a "Shades of Grey" experience, as clips from past shows are intermixed with Daniel, Darren, and Phillip's list of "thank you's" to those many people who helped made their time at Trek.fm something they will never forget. They also spend their last moments recognizing what they learned most from each other (though not holographically in front of a Windows 95 desktop background). "You just don't get it, do you, Jean-Luc? The trial never ends. We wanted to see if you had the ability to expand your mind and your horizons. And for one brief moment, you did." Earl Grey spent time exploring the best way to experience bij, the importance of the shift key, and why it's not important to remember Q-episode titles. More than that, they explored and exhibited the spirit of Next Gen - a utopian vision of the future where the ties of friendship ensures that a crew can survive any danger and improve themselves through shared missions of exploration. Earl Grey remind all listeners to stay tuned and that a new crew will soon take their stations ... after all, there's still plenty of letters left in the alphabet. "In any case, I'll be watching. And if you're very lucky, I'll drop by to say hello from time to time. See you ... out there!" Star Trek. 50th Anniversary. Las Vegas. A once-in-a-lifetime gathering. Phillip, Daniel, and Darren share their experiences of meeting each other for the first time -- in real life! -- and what it was like to celebrate Trek's 50th Birthday with several thousand fellow fans at the Rio Hotel/Casino/Convention Center, off the Las Vegas Strip. The trio talks about meeting other trek.fm cohosts, Earl Grey listeners, celebrities, and even R2-D2. 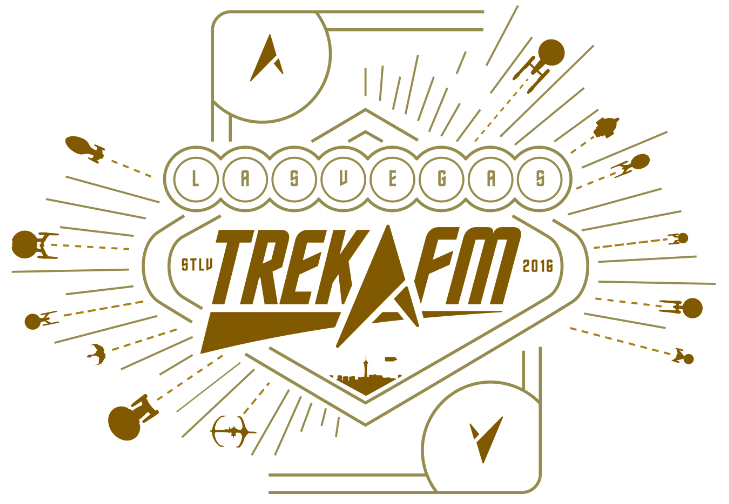 They describe how their hotel suite served as a "Ten Forward" (their room number was literally 17001) for the week, hosting a meetup for all Trek.fm hosts and listeners, as well as providing the ultimate gaming experience with "Star Trek: Scene-It?" and "Star Trek: The Next Generation Interactive VCR Board Game: A Klingon Challenge." Las Vegas is the ultimate place to experience Biij ... and Darren even gets the official endorsement from not-Gowron himself. Their STLV experience also includes attending TNG-themed celebrity panels - Whoopi Goldberg (Guinan), in her first Star Trek convention appearance, as well as Jonathan Frakes (Willam T. Riker), Marina Sirtis (Deanna Troi, a previous Earl Grey special guest star! ), and Michael Dorn (Worf). The Earl Grey team took up many photo opportunities dressed in their Next Gen uniforms, Daniel met Q, and Darren was excited to find a copy of a certain TNG novel, "Ship of the Line." The highlight of the Earl Grey STLV experience is, of course, Super BridgeMates - recorded live at the #Roddenberry Stage at Quark's Bar. Phillip hosted the three teams of Free Enterprise (Daniel and Darren), Team Lizard Babies (Charlynn Schmiedt and Tristan Riddell) and the Council of Mistresses (Andi Vanderkolk and Jarrah Hodge). Listeners get to experience what happens when three teams must answer random Trek trivia questions, guess episodes/movies as they are acted out by audience members, and stumble around with cosplayers. Phillip does warn listeners that there was a hiccup on his part that may leave the answer of who won this epic showdown entirely up to the listeners' decisions. Earl Grey thanks everyone who made this fun-filled panel possible. Join Earl Grey as they drink a James Tea Kirk from the Rio Masquarade Bar, drop a few coins in the penny slot machines, and sing their hearts out at Klingon Karaoke, as they share their experience at Star Trek Las Vegas. Phillip, Darren, and Daniel wish to announce that this is their penultimate episode of Earl Grey - this bridge crew has decided now is the time to move on to another continuing mission. The next episode of Earl Grey will be their last episode - listeners are encouraged to share their favorite EG moments with the crew before the trio sits down for their last poker game. Earl Grey will soon continue with a new crew and new adventures, celebrating all things Star Trek: The Next Generation. Live together at Star Trek Las Vegas in room 17001 Daniel, Darren & Phillip are joined by the hosts of To The Journey, Charlynn and Tristan. Taking a concept from Earl Grey Episode 147 "Square Root of Spock" they rewrite the episode Elementary Dear Data to take place on the holodeck of the USS Voyager. Instead of Professor Moriarty gaining sentience it is Tom's Captain Proton program. Five podcasters in one room, who knew talking trek could be this fun. Star Trek: The Next Generation premiered on television in 1987 - almost 30 years later, the second live incarnation of Star Trek on television remains a vital part of the franchise and an enduring pop culture icon. Phillip, Daniel, and Darren have taken apart TNG for over three years on this podcast - discussing characters, story lines, technical aspects, themes, and everything else in between. This has led to one great question: What is behind the enduring popularity of Next Gen? Earl Grey conducts a roundtable discussion that focuses on how TNG remains relevant, what characters and storylines fit in with today's world, and how new fans are "re-discovering" a thirty-year-old television show. They examine the reputation of Next Gen compared to the other Trek series, what the stereotypes are, and what the "popular opinion" is of Captain Picard and the crew of the 24th Century starship Enterprise. Join Earl Grey as they compress their 3 years worth of discussions into one retrospective episode about the enduring popularity of Star Trek: The Next Generation. Listeners know #BridgeMates from Earl Grey episodes 82 (“When in Doubt Choose Data”), 109 (“He Hasn't Watched That One”), and 141 (“The Council of Mistresses”), as well as To the Journey 117 (“BridgeMates Rematch”) and Standard Orbit 102 (“Trying to Kill Zoolander”). There is even the original trivia panel show “Encounter at All Good Things” from Earl Grey 137. Earl Grey is proud to announce a live presentation of “Super BridgeMates” at the Star Trek Las Vegas 50th Anniversary Convention on Friday, August 5 from 12:30 to 1:15 pm. It will be held on the Roddenberry Stage at Quark's Bar, hosted by Phillip Hunter Gilfus. Your favorite team of “Free Enterprise” (Darren Moser and Daniel Proulx) will attempt to escape defeat (again) against two rival BridgeMate Teams - “Team Lizard Babies” (Charlynn Schmiedt and Tristan Riddell) and “The Council of Mistresses” (Andi VanderKolk and Jarrah Hodge). Time is a funny thing - especially when you draw an emoticon on a temporally-frozen warp core breach. Captain Jean Luc Picard reminds Data in a deleted scene in Star Trek: Nemesis that the presence of time is a chance for humans to perform certain rituals. In keeping with that tradition, Darren, Daniel, and Phillip celebrate their 150th episode of talking all things The Next Generation by providing a commentary to their favorite series' 150th episode. In this season six, 25th episode - Timescape - the crew of the Enterprise-D find themselves more-or-less frozen in time while aiding a damaged Romulan warbird. Picard, Data, Troi, and Geordi, after perfecting some comedic impersonation skills, must find a way to fix this unique time travel puzzle, all while encountering a new alien species. Join the crew of Earl Grey as they beam aboard a high-definition Starfleet runabout, explore the interiors of a Romulan warbird, and find they have problems with the fast forward/reverse button on their time controllers in this commentary episode of "Timescape." A returned Dr. Beverly Crusher and new pop-up collars on uniforms - these are some of the many additions that TNG's third season brings - but what are the essential episodes? Daniel, Darren, and Phillip comb through all 26 episodes in the "Earl Grey Supreme Court" to determine which episodes should be considered the Trek.fm essential episodes. The question of "essential-ness" is often tied to continuity in the Trek universe, but this episode brings up the difficult question of continuity in the Trek.fm universe. Join Earl Grey as they eagerly debate if the Great and Powerful Kevin will remain so great and powerful, whether the Leah Brahms storyline must remain in Next Gen, and if anyone actually remembers the episode "The Vengeance Factor." The third season of TNG is generally considered to have many of the most-watched episodes, but which stories will make the cut? Let us know if you agree with Earl Grey's essential episodes of season three. For a second time, Phillip, Daniel, and Darren explore a season's worth of Star Trek: The Next Generation episodes and decide which stories might be better explored in their sister Trek series. In Earl Grey 124 "Hide and Trelane," the trio delved into the inaugural season of Next Gen - this time it is season two's turn to be "Trek Switched." As usual, the co-hosts can choose to either rewrite an episode or make it a prequel/sequel story for Enterprise, The Original Series, Deep Space Nine, and Voyager. This episode asks how would Captain Jonathan Archer and the NX-01 crew deal with the "explorer" Nagilum in the 22nd Century? Earl Grey re-visits controversial ground by setting "The Child" in the series it was originally meant for - the original NCC-1701. The threat of the Dominion War causes Captain Benjamin Sisko and his Starfleet crew to face off against their Bajoran militia co-workers in a version of "Peak Performance." Lastly, Captain's Assistant (or Assistant to the Captain) Naomi Wildman causes a great debate about the prime directive when she ends up with a new "pen pal." Join Earl Grey as they "Trek Switch" season two of The Next Generation with all the other live action Trek TV series. 146: What Does God Need with a Geo-Political Governmental Body? The classic topics that are considered impolite to discuss with company are money, religion, and politics. Since Earl Grey already did an episode about money ("EG 58: Scarcity, Scarcity, Scarcity"), it is now time for them to discuss religion. Most fans know that Star Trek creator Gene Roddenberry was an atheist who believed that humans would "outgrow" religion by the 23rd and 24th centuries. The Next Generation features a diverse crew who do not seem to display any beliefs that one would characterize as "religious." Phillip, Daniel, and Darren nevertheless examine Lieutenant Worf's Klingon culturalism and his battles with faith ("Rightful Heir"), Lt. Cmdr Data's search for self-actualization with his "creator" ("Brothers"), and Capt. Picard's role as a leader of a crew with various religious/non-religion beliefs. The trio also examines the "guest star" aliens' religious beliefs, from Ensign Ro's "cultural Bajora-ism," the conflict in "Who Watches the Watchers? ", to the enduring Native American spiritualism in "Journey's End,"; from Ardra's role as the Devil ("Devil's Due"), to the role of "doctrine" in "The Outcast." Join Earl Grey for a discussion about the nature of religion and personal beliefs in The Next Generation. Daniel, Darren and Phillip continue the proud Trek.fm "essential" tradition of breaking down a season of their favorite series, sorting through which episodes should be officially kept. The trio begins, reluctantly, with "The Child" and makes their way through Next Gen's too short a season, all the way to "Shades of Grey." There are quite a few 2-1 votes for whether an episode is considered "essential" in this installment - that is, whether it embodies the spirit of TNG or sets up much-needed elements for later Next Gen or later parts of the subsequent Trek series. Earl Grey discusses when Lwaxana Troi should "officially" show up, whether "Q Who?" should be "very essential" or "most essential," and if Worf's "two bridges?!?!" must officially be retired. Season two of Star Trek: The Next Generation suffered from a series of writer strikes and bad plots, along with captivating stories ("The Measure of a Man"), new characters (e.g., Guinan and Dr. Pulaski), and promotions for our crew. Join Earl Grey as they hold up season two to the "essential" winnowing process. It's a Star Trek cliche in the 24th Century - the Holodeck breaks down, threatening our favorite Starfleet crew members, and hijinx ensue. However, the concept of the Holodeck means more than just using it for off-hour recreational purposes. The use of holographic technology changes the way the crew of the NCC-1701-D approach their work and the way they view their lives. Darren, Daniel, and Phillip dissect The Next Generation's use of the Holodeck as a tool in the workplace. The Federation flagship, like the modern office, must conduct employee training - but instead of tedious PowerPoint presentations, officers take tests in the Holodeck for promotion ("Thine Own Self"). Instead of researching documents on LexisNexis, crewmembers can call up holographic recreations of facilities and people who can directly give needed information ("Booby Trap"). Groups who need to reconstruct people's memories or eyewitness accounts can congregate in the Holodeck to see if they can create the same picture ("Schisms"/"A Matter of Perspective"). Join Earl Grey as they outline the many non-fantasy uses of the Holodeck. Star Trek: The Next Generation features great characters, but there's no doubt that Captain Jean-Luc Picard and Lt. Commander Data get the bulk of fan attention. Chief Engineer Geordi La Forge does not often get the spotlight, so in this episode, Phillip, Darren, and Daniel showcase his best moments. The trio goes round-robin, discussing episodes like "The Arsenal of Freedom," "I, Borg," and "Interface." Levar Burton embodied a memorable character for seven years on television and in four feature films - whether portraying a desire for sight, a strong friendship with an android, or a passion in his beliefs. His laughter and ability to emote behind the VISOR makes Lt. Commander La Forge a great member of the TNG family. Join Earl Grey as the discuss their favorite Next Gen moments featuring La Forge. Star Trek: The Next Generation viewers may notice a frequent appearance of a buzz-cut Starfleet officer either manning the helm, walking down the corridor, or attending Ten-Forward performances. She is known as "Lt. Jae" and was played by Tracee Lee Cocco (http://www.ltjae.com) in seasons four thru seven, as well as the Star Trek: Generations, Star Trek: First Contact, and Star Trek: Insurrection. Tracee discusses with Daniel, Darren, and Daniel about her time aboard the NCC-1701-D, both as Jae and other roles. Join Earl Grey as they discuss exploding consoles, cosplaying, and life on the Enterprise with Tracee Lee Cocco. Daniel, Darren and Phillip begin a journey through Star Trek: The Next Generation to determine which episodes are "Essential" to the Trek viewing experience. Battle lines will be drawn, Justice will be debated, and coins will be flipped. Season 1 has been a contentious point in past episodes, how will it fare under the scrutiny of the Earl Grey Team? It's time to turn the table on the three co-hosts - instead of them talking about their chosen topic, the trio answers listener-submitted questions in the first "Ask Me Anything, Earl Grey Edition." Through e-mail and Babel Conference comments, Darren, Daniel, and Phillip reveal their non-Trek-based hobbies, favorite podcasts, and how they got start with the trek.fm network. Daniel is put on the spot about his feelings on "Time's Arrow (Parts 1 and 2)" and Commander Flipper's career track. Darren explains his many Star Wars-based real life adventures. Phillip talks about creating his many "Star Trek: The Next Generation"-based games. This AMA also reveals a hidden talent of Daniel's, as well as almost stumping the hosts about what non-TNG episodes should be placed in Next Gen. The co-hosts end up "submitting" questions of their own to be answered, takes some questions for future episode ideas, and drop hints about upcoming episode topics. Join Earl Grey as they answer your questions in their first ever "Ask Me Anything" episode. Every Next Generation episode that has a part one mustconcludethestory in part two - so it goes with Earl Grey'soriginal"mirror"Next Gen episode. In Earl Grey 135 "Fabio'sMirror,"LieutenantsWorf and Barclay, along with Ensign Ro,foundthemselvesunexpectedly trapped in a universe where CaptainWillRiker leadsthe crew of the Enterprise V, along with hisfirstofficer DeannaTroi and Terminator-like enforcer Data. At theend ofthe laststory, Reg was attempting to impersonate hismirrorcounterpart, aninjured Worf was guarding the PrimeUniverseshuttlecraft, Ro wascrawling through the ship in herblackpajamas , andIntendant Jean-Luc Picard was teaming up withDukat tofurtheroppress the Bajora. In the epic conclusion, Darren, Daniel, and Phillip endthestorywith an engineering crew that will kill their crew matesassoon asrepair an EPS conduit, Reg finding a way to use Dataintheandroid's seldom used "danger mode," and asurprisingappearancefrom the Enterprise V's chief medical officer.Join EarlGrey on a"mirror" adventure that will either have youhungering formorestories from this "parallel" universe or else makeyou gladTNGnever attempted this story on their own. After seven years on television, Star Trek: The Next Generation launched a second Trek movie franchise with the inaugural TNG movie, Star Trek: Generations. Star Trek fans, both Original Series and Next Gen-ers, have long discussed their feelings about the eagerly-awaited meeting between Captains Kirk and Picard, Data's emotions, the destruction of the NCC-1701-D, and the death of Kirk. However, one Trek fan just watched the movie last week - Andi VanderKolk, better known as FirstTimeTrekker. Andi joins the Earl Grey crew and shares her thoughts about Captain Alan Ruck...er, John Harriman of the Enterprise-B, how Dr. Tolian Soran was able to speak great lines while sporting a great coat, and how the star of the entire movie is Spot the Cat. The crew talks the expectations of the first TNG movie, the role of Captain James T. Kirk, and how the story could have been improved. Join Earl Grey as they talk the high and low parts of Star Trek: Generations. One story type that didn't make its way into The Next Generation was the Mirror Universe. What will our favorite characters do when faced with their evil go-tee wearing counterparts? What if Data was a crazy red eyed robot controlled by Captain Riker? What if Picard had flowing locks of hair? This week Darren, Daniel and Phillip start rewriting "Parallels" to become the TNG chapter of the Mirror Universe. 134: Who Shot Captain Picard? TNG Two Parters. The Best of Both Worlds was one of the most pivotal cliff-hanger stories in Star Trek: The Next Generation. TNG created eight two part episodes that extended a single story into several plot layers and great character moments. Long before the "long format" approach to story telling, this was the best way to enhance suspense and draw out a characters arc. Join Darren, Daniel and Phillip as they compare the strong vs weaker halves of TNG's two parter's. Free carpet samples. Lounge chairs. Lots of computer monitors. Some nice, polished wood. For some reason, no one has gathered these items for a Next Generation-based fan film production. Throughout the decades, amateur productions have been predominantly set on 23rd Century Constitution-class vessels. In more recent years, productions like "Star Trek Renegades" has reached past the shows of the 24th Century and "Star Trek: Horizon" has looked "back" into the 22nd Century. But there are no current fan web series based during the seven-year television run of TNG. Phillip, Daniel, and Darren put on their "fan production" hats and explore why there is this "gap" of fan productions for Next Gen. They discuss whether TNG has a unique fandom, whether there is a lack of enthusiasm for Enterprise-D based web series, and whether something like "Red Shirt Diaries" can be done for the "lower decks" of the NCC-1701-D. Join Earl Grey as they delve into what role they would play in a TNG fan film and how "ENSiGNS" can only be made possible through supporters like you. The Next Generation introduces several individuals, including some "re-shaping" of our own favorite characters, who are seen as supernatural characters. This can mean that they are either all-powerful, mysterious, tricksters, or "flim-flams." Darren, Daniel, and Phillip create their own originally named "Q Continuum" of supernatural beings, from the scary "Kevin" ("The Survivors") on one end to Ardra ("Devil's Due") on the other. Supernatural characters can be shrouded in the cloak of religious worship like the Edo Guardian ("Justice") and "The Picard" ("Who Watches the Watchers?") or they could be just a different scale of lifeform like Nagilum ("Where Silence Has Lease") and Q. Join Earl Grey as they seek out new lifeforms who go beyond the realm of human beings and explore supernatural beings in Next Gen.
We all know and love the trials and tribulations of our beloved TNG crew throughout seven seasons and four feature films ... but how did it all begin for them? Daniel, Darren, and Phillip sit down and create an outline for a "Countdown to 'Encounter' [at Farpoint]" comic book series. The trio imagines a comic book run, similar to IDW'S "Star Trek: Countdown" and "Star Trek: Countdown to Darkness" for the JJ-verse movies, that picks up our characters' lives years before they joined the ranks of the Galaxy-class Enterprise-D.
Earl Grey begins issue one with the dramatic court martial of Captain Jean-Luc Picard, following the disastrous loss of his first command, U.S.S. Stargazer. Picard must deal with an overzealous prosecutor, Phillipa Louvois, as well as a visit from recent widow, Dr. Beverly Crusher. The next issues focus on young baby-face Lieutenant William T. Riker and Deanna Troi on Betazed, as the gold-suited Starfleet officer finds himself choosing between love and career promotion (along with a new color uniform). Other issues follow a recently discovered and reactivated android, named Data, who finds his life choices continually challenged by a Lieutenant Bruce Maddox. The trio also creates issues focusing on the Cardassian War, with a young Natasha Yar and Miles O'Brien teaming up to defend Starfleet, as well as a time jump forward to the U.S.S. Hood as Ensign Geordi LaForge continually tries to escape the attention of his meddlesome first officer, Lieutenant Commander Riker. Join Earl Grey as they tell these prequel stories and more of the early adventures of the soon-to-be-infamous crew of the Federation's flagship, U.S.S. Enterprise, NCC-1701-D in Season Zero of The Next Generation. We have all seen episodes (or entire seasons!) of television shows that end with, "It was all just a dream!" It can sometimes feel like such storytelling is a "cheat" or are a waste of time. This week, Phillip, Darren, and Daniel pick out episodes of "The Next Generation" that may not have "really" happened, as far as the crew of the Enterprise-D is concerned. The trio asks whether these episodes are still enjoyable or whether it would have been better to have a storyline that "actually" occurred instead. Earl Grey examines episodes featuring amnesia, such as "Conundrum" and "Thine Own Self," as well as "It was all an illusion!" episodes like "Future Imperfect," "Remember Me," and "Frame of Mind." They also tackle "complicated" fan favorites such as "Inner Light," "Yesterday's Enterprise,""Tapestry," and "All Good Things..." They look at whether episodes that are "outside" reality help or hurt a story. Other episodes they look at include "Parallels," ""Tapestry," and "Cause and Effect." Join Earl Grey for this week's podcast about the "never happened" episodes ... which hopefully will not be considered a waste of time for listeners (though they may hit the reset button at the end). Fans do not generally regard the sixth season episode "The Chase" as a classic TNG story. However, it offered Captain Jean-Luc Picard a chance to embrace his archaeological passions and embark on an "Indiana Jones"-like adventure including many Alpha Quadrant aliens. "Earl Grey" decides to re-write this episode with the additional challenge of making a new "Yesterday's Enterprise" -- but, this time, with the U.S.S. Enterprise, NCC-1701-B. In this telling of "The Chase," Darren, Daniel, and Phillip keep much of the beginning of the episode, but instead create a new planet, familiar aliens on this adventure, and a voice from the history books. Look for Picard, Data, and La Forge, along with some strange bedfellows, to meet a storied captain ... and she may make the ultimate sacrifice. Join "Earl Grey" as they re-write "The Chase" to include the Excelsior-class Enterprise-B. In a laugh out loud roundtable pitch session Phillip, Daniel, and Darren are joined by Aaron Harvey to create the Star Trek: The Next Generation Animated Series. Set in the late 90's after Generations this series will be animated TO THE EXTREME! Delving deep into 90's nostalgia the story, characters and merchandising opportunities all align in this crazy pitch session. Imagine Commander Flipper on a skateboard, soccer moms buying Ketracel-white cooler pouches and John de Lancie being a live action character. Premiering next summer on UPN kids, Star TreXtreme! Captain Jean-Luc Picard faced down Romulan warbirds, Cardassian guls, and Borg drones ... but he met his match when it came to Lwaxana Troi, the daughter of the Fifth House, holder of the Sacred Chalice of Rixx, and heir to the Holy Rings of Betazed. Ms. Troi, later named an ambassador representing her home planet of Betazed, provided moments of embarrassment for her daughter Deanna. However, she brought a unique mother-daughter relationship to The Next Generation, as well as portraying a "woman of a certain age" with a healthy sexual attitude. From her appearances in "Haven," "Manhunt," and "Ménage à Troi," Troi brought doses of humor and spontaneity. Lwaxana served more than comic relief, though - her struggles in "Half a Life," "Cost of Living," and "Dark Page," provided a more dramatic turn for her character. Daniel, Darren, and Phillip discuss this TNG character who appeared throughout the seven years of the Enterprise-D on television. Join Earl Grey as they hit a gong in appreciation for Lwaxana Troi, daughter of the Fifth House, holder of the Sacred Chalice of Rixx, and heir to the Holy Rings of Betazed. Earl Grey 125: Road Trip to the Delta Quadrant Bro! When it comes to #BridgeMates on Star Trek: The Next Generation, the first pair that comes to mind is the first season conn officer Lieutenant Junior Grade La Forge and second officer Lieutenant Commander Data. The jovial character of Geordi, with his "artificial sight" (VISOR), did not necessarily seem similar to the personality of the naive "artificial life form" at the operations stations. But whether it was Data playing the straight man to La Forge's joker or their first foray into the Holodeck as Sherlock Holmes and Dr. Watson, this duo developed a friendship that evolved through their promotions and developments on the Enterprise-D.
Daniel, Darren, and Phillip examine moments that feature the Data and Geordi relationship, from "11001001," "The Price," "Descent, Parts 1 and 2," and "Star Trek: Generations." They discuss how, while there may not have been episodes that spotlighted the duo, the android and the chief engineer became inseparable through their many trials and tribulations on the Federation's flagship. Join Earl Grey as they discuss the friendship between Geordi and Data.